I would like to remind you all on this weekend's garage sale that will take place in my home. There are slight changes on the items that will be sold. We will NOT be selling our home items anymore. There are a couple of nice ladies who are moving into our apartment when we leave. However, we have tons of clothes, shoes and bags that we are selling. 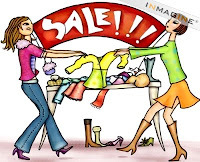 If you are looking for pieces of clothing at bargain prices, please come and take a look! Please spread the word to your family and friends. Hope to see you this weekend!